Whenever I get a chance to attend a college practice, I make sure to bring my notebook to write down anything that might be valuable to help us train young players or teach young coaches. 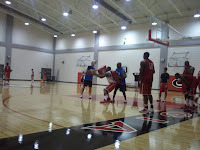 Today, up in Athens, Georgia I watched the Bulldogs practice for a couple of hours in preparation for their game against UAB. Now, I have been to about a dozen practices since Mark Fox has been the coach, but everytime I'm up there I pick up something new from him and his staff. At the top of John Wooden's Pyramid of Success is Competitive Greatness. Now, in order for a team to achieve that the team must have a great coach. And Coach Fox is just that. He is a fearless leader who takes command of his players, staff and practices. He opened practice with a brief message about where the team stood and what they needed to accomplish that day at practice. The energy level was extremely high throughout 99% of the practice, however at one point during practice, there was a lull of energy. Fox reminded his players. "that enthusiasm is contagious," and that a couple of the players needed to lift the rest of their teammates energy levels. Not only is enthusiasm contagious, but it is also one of Wooden's corner building blocks on his pyramid. Fox not only tells players how he wants things done, he shows them how he wants it done. During drills, he will act as another defender, show guards how to make the pass, he'll even hit the Bigs with a pad to get them used to contact. During the scouting report, Fox put on a blue jersey and played for 15 minutes as one of UAB's starters. After hitting a 15 footer, Fox told the Georgia player guarding him, "I'm 6'3 and 42 years old and hitting shots on you. Whats the (UAB player) gonna be able to do?" High School players ask me all the time how much difference there is between high school and collegiate practice. It's immeasurable. Practice is longer. Coaches are tougher. Players are bigger and faster. And concepts and terminology are more immense. The three things I noticed in this practice is that are much different than typical high school practices are: Sounds, Intensity and Comradery. By sounds I mean players voices. Players on the college level talk and communicate much more with each other than most high school teams. I always joke that players talk on the way to practice, in the locker room and after games, but when they are on the floor most of them fail to talk to their teammates. I think the easiest way to teach player communication is through the Shell Drill. The intensity level easily doubles from the high school level to college. I think this tends to be because on most high school teams there is a notable difference between the top few players the the rest of the squad. Many times the top player(s) can go half speed and still beat their teammates. For the most part on the college level, there is less disparity from player 1 to player 12 and thus players battle and fight on a more level playing field which in turn makes for a more intense practice. Lastly is comradery. College players eat, sleep, practice and go to school together. The more you are with teammates the more comradey you will have. On the high school level, players typically go home after practice and do not see each other until the next day at school. On the college level, players have study hall after practice, then eat together and then head back to the dorms together. To make up for this, I think it is vital that high school coaches take their teams to out of town tournaments as well as social events planned together as a team. As I mentioned earlier, I take every opportunity to watch college practices. One of my mentors, Coach Jim Harrick once told me, "You can always learn from a coach. Sometimes it's what to do, and sometimes its what NOT to do." In the case of Fox and his Bulldogs, its what to do.